Arrive in Criccieth by car or train and check into the Gwynle Hotel. There is a car park opposite where your car could stay for the whole holiday. 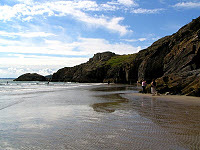 Criccieth is a lively seaside holiday town with much to see and a famous castle. Follow the Wales Coast Path along the glorious Black Rock Sands beach to Porthmadog where you will have time to see the lovely marina, maritime museum, shops and the Ffestiniog and Welsh Highland Steam Railways before taking the bus back to your hotel in Criccieth. Today’s distance would be approximately 7 easy miles to get you warmed up for the days ahead. Today you will be heading west. We will meet you at breakfast to collect your bags and brief you on the journey ahead. You have the option of a direct route of 13 miles, or a diversion to include the historic village of Llanystumdwy (childhood home of Prime Minister Lloyd George) and the celebrated Lon Goed path which would increase the distance to 16 miles. The day’s walk will finish in the distinctively Welsh town of Pwllheli and the Crown Hotel on the High Street. 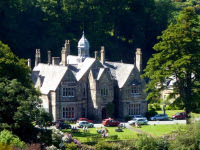 Continue your journey west along Crugan beach to Llanbedrog where you can visit the famous art gallery Plas Glyn y Weddw (and cafe) before ascending through woodland onto Mynydd Tir-y-cwmwd and on to Abersoch where you will stay at the St Tudwal’s Inn. Abersoch is a pretty harbour town with plenty of places to eat. Your walking distance today would be 10 miles. This is the day you will tackle the Cilan headland and Hell’s Mouth beach before finishing at the beautiful National Trust manor house Plas yn Rhiw. We will pick you up from here and take you on to Aberdaron where you will stay at the Ship Hotel for the rest of your holiday. 14 miles. We will return you to Mynydd Rhiw from where you can walk along the ridge above Plas yn Rhiw and enjoy stunning views into Snowdonia before complete the walk along the dramatic coast back to Aberdaron. 10 miles. Today you have the option of taking the boat across to Bardsey Island, the “Island of 20,000 Saints”; a glorious nature reserve and destination for pilgrims for over a thousand years. Alternatively you could complete a circular walk around the magnificent Mynydd Mawr headland. Today we would take you back to your car, or to the train station at Pwllheli. Our single supplement would be £20 per night. The prices above include bed & breakfast accommodation over 7 nights, minibus transport and use of the maps and GPS and care and attention throughout. We may use similar accommodation of equivalent standard if the above locations are unavailable. For more information, or if you would like to book, please telephone us on +44 (0)1758 760652, or email us at enquiries@edgeofwaleswalk.co.uk. Looking for that unusual gift? Copyright © 2015 Edge of Wales Walk. This website uses Google Analytics to help analyse how visitors use this site. Read more..